The days are long, the sunshine is out, the BBQ’s are going – summer is in full swing! 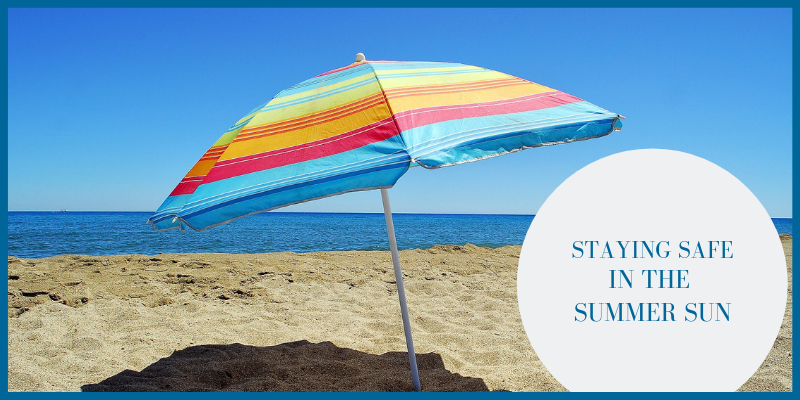 There are benefits to limited sun exposure, but the sun can also lead to skin damage, heat stroke or worse but there are ways to protect yourself while making the most of the summer. Here are a few tips to help keep you protected against harmful UV rays while enjoying the great British Summertime. The UV rays are at their strongest between 10 a.m. and 4 p.m. Try to limit your exposure during these hours by staying indoors or, when not possible, seek out shade. Wear suitable clothing such as a wide-brimmed hat (3 inches or more brim provides the best protection) made from a tightly woven fabric like canvas to protect your face, scalp, neck and ears. A long sleeved top and trousers provide further protection for your skin against harmful rays. If this isn’t practical, a t-shirt will still provide protection. Our eyes are also susceptible to UV rays so it’s important to protect them as well by investing in a good pair of sunglasses. Be sure to look for pairs that carry the CE mark and the British Standard BS EN 1836:2005, which ensures they offer protection from ultraviolet light. Prolonged exposure to UV rays can lead to a number issues including cataracts. The World Health Organisation has estimated that around 20% of people globally, each year, lose their eyesight to cataracts, which could be caused by or enhanced by sun exposure. UV rays can cause damage in as little as 15 minutes. When choosing a sunscreen to protect your skin, select one that is labeled ‘Broad spectrum’ which has been tested and provides protection from both UVA and UVB rays. Choose at least SPF 15 and be sure to apply 15-30 minutes before going outside. Sunscreen isn’t waterproof or sweatproof. Re-apply at least every two hours and more frequently if you’re swimming and sweating. Towel drying removes sunscreen so be sure to reapply after drying off. Be sure to check the expiry date on your sunscreen as it typically has a shelf life of 2-3 years but also, storage in high temperatures can affect sunscreen’s protection abilities so replace any sunscreen you’re unsure of or that has expired to ensure you’re protected. Be sure to drink plenty of water regularly to replenish the fluids lost from sweating, particularly if you have to be out during the hottest part of the day or if you’re running around.